5/30/2007 – How is his health, has his illness been cured? How does he like married life? What were the problems regarding his participation in the upcoming world championship in Mexico? What happens if he does not win this tournament? Is he sufficiently motivated to try? 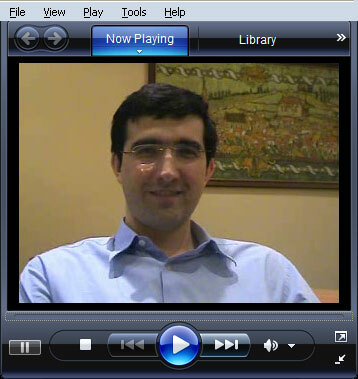 We have conducted a long video interview with World Champion Vladimir Kramnik and bring you, in multiple parts, his candid answers. The following interview with World Champion Vladimir Kramnik was conducted during the Miskolc rapid chess match against Peter Leko in April this year. We bring you the entire interview in multiple segments, with a fairly comprehensive transcription of each. The video is available in two different compressions, both with optimal sound. Depending on your Internet connection you can use either of the links given below the screen captures. Frederic Friedel: We are in Miskolc. The last time we spoke you were pretty ill. How’s your health today? 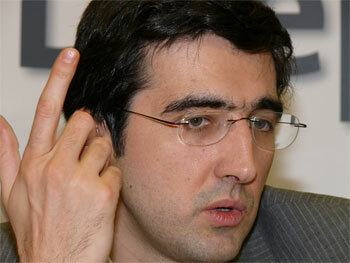 Vladimir Kramnik: Well, now it is much better. My condition is very stable, I actually completely stopped my medication course about a month ago. I may need to take it again in the future, but at the moment I feel very stable and very fine. I hope so, but the problem is that it is chronic, and even the best doctors on this disease cannot guarantee anything. Medicine is not yet advanced enough to explain why it happens, why it goes away and why it comes back. Dealing with it is still in the experimental phase. Anyway, even if the crisis comes back one day I will know what to do and how to deal with it. How does it affect your chess? It’s clear that when you take a lot of very strong medication, which is what I was doing for one year, you cannot perform chess at a high level. But now I am not taking them any more and recently I was quite satisfied with my play. I played quite well in Wijk aan Zee and in Monaco, so for the moment everything is excellent. I got married and am very happy in my marriage, especially after this very difficult, dark part of my life. Now I am really enjoying myself. I feel much better physically and psychologically, and of course my chess is becoming better. For the moment everything is all right. So how is married life? It’s very good, I am very happy that I found my second part. Actually I could have married earlier, but I did not have time. It was very difficult in my professional life. I had to play a world championship match, then a match with the computer, then tournaments and tournament preparations. Unfortunately we did not have a full honeymoon as it should be. It was only nine days. But still it was a very nice trip, just before Wijk aan Zee. The religious wedding was in the beginning of February, and this was also very nice, with a little party afterwards, with many of my friends, like Boris Spassky. It was a very memorable moment for me, and I will remember it for a very long time. So I am very happy in my private life now, that is all I can say. Why didn’t you bring Marie here to Miskolc? Actually she would have liked to come, but she is working for [the newspaper] Figaro as one of the chief editors of the section “Debates and Opinions”, which are rather important pages of the newspaper. This is a very hot period in France because of the Presidential elections, between the two rounds, so now she is just too busy at work, and they won’t let her go. Maybe next time. Frederic Friedel: In September there is a World Championship in Mexico and you have agreed to play. Were there any problems in the beginning? It was not so easy to find the right solution. After the match in Elista which brought so much interest in chess we understood that it would probably be a good idea to come back to the old match system. But they already had an agreement with the Mexican tournament, they had a deal. But they found a certain solution, which they proposed to me and I said okay, its fine. In fact I would have played in Mexico anyway, but I think it simply would not have been fair towards me. As it is now I think nobody can complain. The players got the world championship in Mexico, everything according to the agreement they had with FIDE before; they also will have a next world championship very soon. The FIDE World Cup will take place already in November, so everything is going according to plan. Let us say I don’t win Mexico, which I hope will not happen. In that situation it would be strange to go back to the match system and to exclude me, because actually I am the last winner of a world championship match. I think they were afraid of this kind of confusion, which would arise again. Most chess amateurs would say “Where is Kramnik? He won the last world championship match and he is not playing now. Who is the world champion: the one who won Mexico or he or what is the situation?” There has been so much confusion already in the last 15 years that I think the decision is quite satisfactory for everyone. But I must say I don’t spend too much time thinking about what will happen if I don’t win. As I said very sincerely before the match with Topalov I did not care if the loser would play in Mexico or not, because I was not planning to lose. I was really very eager to win the match. Okay, if I lose I lose and don’t care what happens after that. It’s the same now. I am very motivated to try and win this tournament and I’m sure my chances are not worse than anyone else’s. I am very confident. In the past half or one year I have been showing a pretty good level of chess and I think that if I can manage to prepare well, to be in a good mood, to be very motivated, I have not bad chances to win the event. For me it is a new challenge. I have already won world championship matches but I have never won a world championship tournament. This one, by the way, very possibly will be the last one in the history of chess. So there is a lot of challenge and I would like to prove to myself that I can also win a tournament – actually I do so from time to time, but I would like to win a tournament that is called the world championship. So I am very motivated and have already started to prepare for this event. I have already more or less made my team. People are working already, and I have made full arrangements for full July and August to prepare for the World Championship match. And I will definitely play only for the first place. 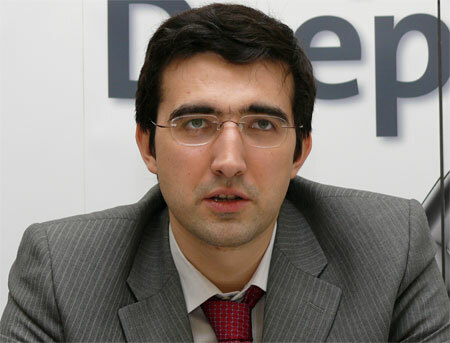 Coming next: Kramnik on Veselin Topalov's participation in the World Championship 2007; on contracts and rules; on the ideal world championship format; on time controls, number of games.